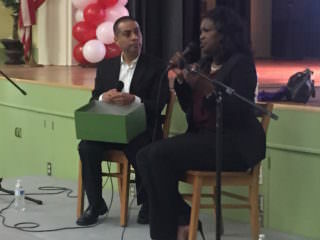 LAUSD board member Ref Rodriguez with Superintendent Michelle King at Tuesday’s forum in Cypress Park. As Michelle King wrapped up her “listen and learn” tour in her first semester as LA Unified superintendent, she said she still has more listening to do before announcing her priorities, a strategy that some experts said could make her more successful than her predecessors. Tuesday’s 8 a.m. town hall at Nightingale Middle School in Cypress Park was the last of three large forums on her tour before the end of the school year and attracted a little more than 100 people. The first, in March at Pacoima Middle School, drew about 700 people, while about 500 attended one earlier this month at Gage Middle School in Huntington Park. Antonio Plascencia Jr., who leads King’s transition team, said that the superintendent has held about 20 other meetings of various sizes with audiences from high school students to school facilities managers and members of community groups. Plascencia said the qualitative data collected at the meetings will be used to develop King’s strategic plan. Some parents said Tuesday it was the first time they had ever seen an LA Unified superintendent at their neighborhood school. District officials said they believe King is the first superintendent to have an organized series of forums to meet with parents and the community. “No previous superintendent has ever done that. I think that’s a good start,” said parent Courtney Everts Mykytyn. Experts said that King’s approach of meeting with parents and community members before revealing her priorities is wise. Pedro Garcia, a professor of clinical education at USC’s Rossier School of Education, said King’s leadership style is to build relationships and a support team that will help to carry out the vision. “She knows the system. She has a much better perspective than the previous superintendent,” said Garcia, a former schools superintendent in Nashville, Tenn., and in districts in California. Pedro Noguera, distinguished professor of education at UCLA’s Graduate School of Education and Information Sciences, agreed. He said around the country he’s seen some new superintendents immediately take charge with big ideas, while others take a long time to come up with a strategic plan. He said he’s rarely seen superintendents with the former approach become successful. He said King’s strategy is somewhere in the middle. “I think it’s a smart approach, and the reason why is I think that is part of what she’s got to do is demonstrate that the district is going to be responsive to the concerns and the aspirations of the community and take that into consideration,” Noguera said. “She’s got to start to rebuild a sense of confidence in the school system, and you can’t do that by just putting out your own ideas, you have to engage in a dialogue,” he added. Noguera also said that King has to make sure the school board is informed about the challenges — particularly financial ones — facing the district before she announces her priorities because her plans must address those issues. “If they don’t fully understand what the challenge is then how are they going to agree to any plan to address them,” said Noguera, who has been hired by the district to facilitate board retreats. The plan that King comes up with must also address the issues that have been raised in these community town halls, Noguera said. Both Garcia and Noguera expect that King will announce her plans by the beginning of the fall. Calling herself an LAUSD “lifer,” King told the audience Tuesday about herself from her experience in the district as a student to a teacher to an administrator. She said she still considers herself a teacher. She said students of all ages in the district told her in various ways they want their teachers to have high expectations of them. She said students also want to have electives at their schools, so they can choose classes like music or art in addition to required courses. Students also want to have a safe environment at their schools. Older students spoke about wanting their schools to implement restorative justice practices. She said she’s heard from parents that they want teachers to teach rigorous curriculum, so that their kids are prepared to go to college or into a career. King also said parents want the district to offer continuous pathways so that if a child is enrolled in a dual language immersion program in elementary school, there is an option to continue that program in middle school and high school. She said the district will expand its offering of dual language programs to include Arabic and French next year. 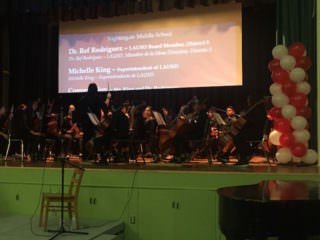 Nightingale Middle School orchestra students performed at the beginning of the town hall event. The audience applauded when King mentioned her plans to expand popular magnet school programs. King said she also wanted to expand the district’s teaching of computer science and coding skills. King said her biggest goal is to raise graduation rates and ensure that students are prepared to go to college. She stressed her belief in school choice and that not “one size fits all,” pointing to the experience she had with her three daughters. “All three of them were different and really had different interests and different needs and so that really became a part of me and my philosophy about making sure that we design, cultivate based on the school’s needs, on a community’s needs,” King said. For Lisette Duarte, who was sitting in the front row of the auditorium, that message hit home. Duarte has a son in the 10th grade who is attending a Partnerships to Uplift Communities charter school on the Sotomayor Learning Academies campus. Her daughter is in 5th grade at Monte Vista Elementary School, a traditional school. Duarte said she appreciated that King came to the community to hear from parents, rather than the superintendent saying this is what the community needs. Tuesday’s event was described as a “conversation.” During the hour-long town hall, King spoke and then was interviewed by school board member Ref Rodriguez, who represents District 5 in east and northeast Los Angeles. Rodriguez asked some of his own questions and then asked about six or seven questions submitted from the audience. Some parents said they wished they could have asked their own questions. Rodriguez said he decided to have audience members submit their questions in writing, so that all of the questions could be addressed even if they ran out of time during the forum. Rodriguez said at another event, parents came up to microphones to ask their questions, and some stood in line at the microphone for 40 minutes and weren’t able to ask their questions. About 45 people submitted questions. Plascencia said the district plans to follow up with people who submitted questions. If the question deals with a school-specific issue, he said, the question will be forwarded to local administrators, and the superintendent’s office would ensure there is follow-up. King said she believed local superintendents and school administrators should be able to address school-specific concerns. Some parents came to the town hall looking for answers about problems at their child’s school. Zaira Cervantes brought her 2-year-old son to the town hall. She said she wanted to tell the superintendent about an issue she has at the Olympic Primary Center, where one of her daughters attends. “I think it’s good to have this meeting, She’s the only one that can help us,” Cervantes said. Cervantes didn’t get the answers she was looking for Tuesday but hoped the superintendent would respond. Another parent, Rosaura Roa, came with a group of parents from Arroyo Seco Museum Science Magnet School. She said she was hoping to speak with the superintendent herself. She spoke with Plascencia after the forum. “I hope she will have answers,” Roa said. Everts Mykytyn said she thought the town hall forum wasn’t the place to talk about an individual issue with her child. She said she submitted a question about how the superintendent would ensure that the push for school choice doesn’t segregate schools. “I’ll be interested to see who and if anyone gets back to me on that question,” she said. Plascencia said the “listen and learn” tour won’t end with the wrap-up of the school year. He said the superintendent plans to have a “back-to-school” series in the new school year.